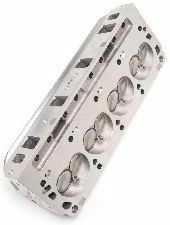 Showing 1 - 10 of 12 Products for Engine Cylinder Head. 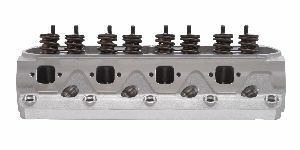 Cylinder Head Specifications: Combustion chamber volume: 75cc / 95cc; Intake runner volume: 292cc; Exhaust runner volume: 100cc ;Intake valve diameter: 2.19"; Exhaust valve diameter: 1.76"; Valve stem diameter: 11/32"; Valve guides: Manganese bronze; Deck thickness: 5/8"; Valve spring diameter: 1.55"; Valve spring maximum lift: .700"; Rocker stud: 7/16"; Guideplate: Hardended steel; Pushrod diameter: 3/8"; Valve angle: TBD; Exhaust port location: Stock; Spark plug fitment: 14mm x 3/4 reach, gasket seat. * Performer RPM 460 heads accept factory exhaust, aftermarket headers and factory valvetrain components. 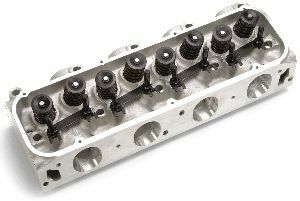 Requires the use of 3/8" diameter pushrods. 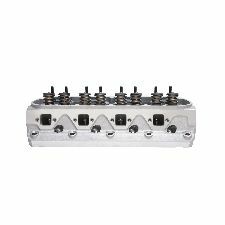 Match with Edelbrock head gasket sets. Bare heads will have valve guides and seats installed, but will require final sizing and a valve job to match the valves you will be using. Recommended spark plugs are Champion RC12YC or equivalent 14mm x 3/4" reach with flat gasket seat. Deck thickness: 5/8", rocker stud diameter: 7/16", pushrod diameter: 3/8" (width of slot in guide plate).